Preventing avoidable readmissions is a focal point of most, if not all health systems big and small. These episodes are often costly to the patient and provider and open up additional opportunities for exposure to hospital-acquired infections. However, some patient populations, especially those with chronic disease and those impeded by socioeconomic factors, are even more at risk. Grady Health, like most systems, has an expected percentage of readmissions based on their history and patient population. 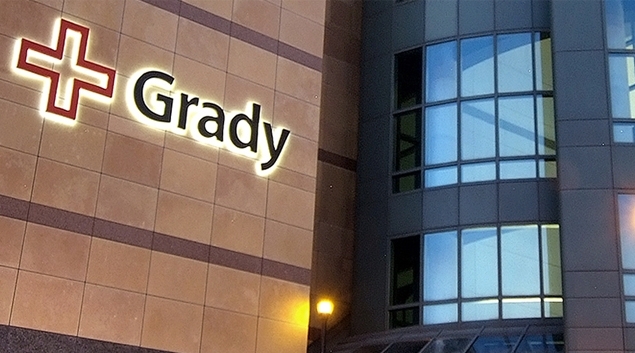 Robin Frady, Grady’s executive director of business and clinical intelligence information services, said when they started focusing on their data and wanted to use AI, they focused in on readmission. They used AI and patient data to deduce which recently discharged patients were at risk of coming back to them for something preventable and started reaching out to those patients via in-person visits from their Mobile Integrated Health Unit, comprised of their EMS staff. Grady said the cost of sending the mobile health members out is minimal compared to the cost of hospital readmission–$ 200 for post-discharge visit versus thousands for a readmission. “It’s this idea of just keeping you healthy when you’re returning home. That you are stabilized and you can return to your normal like as best as possible and if we can send out this service and do this, why not? It’s a small investment for the greater good of these patients,” Frady said. While the use of AI may be in its infancy in many respects, the market is growing and there at at least a dozen leading contenders when it comes to AI platforms, including Microsoft Azure Machine Learning, Google Cloud Prediction API, TensorFlow, Infosys Nia, Wipro HOLMES, API.AI, Premonition, Rainbird, Ayasdi, MindMeld, Wit, Vital A.I., KAI, Receptiviti and Meya. Grady’s Mobile Integrated Health Unit was actually implemented as a crisis intervention program in 2013. But Frady said the decision of who to target was a challenge. In 2015, the system started working with AI vendor partner Jvion on using readmission risk scores to help them decide. They started giving the Jvion the complete list of who had been discharged, handing over all patient data because it was needed for their AI machine, Jvion’s Cognitive Clinical Success Machine, demanded it. They augmented that data, adding in some socioeconomic information such as transportation issues, or predicted medicine adherence issues. “The fact that we are able to augment the data with that additional info helps us be a little more targeted in the correct intervention,” Frady said. Jvion gets Grady’s patient data every day, both inpatient and ambulatory, and the partnership has been going now for 4.5 years. Using the data, augmenting it and entering it in the AI machine, the machine used the data to generate a list of patients at risk for a preventable readmission, assigning risk scores such that Grady could prioritize the patients that needed an intervention most. They also discovered that the best time to visit was 5 to 10 days after discharge. Once they had that list of patients, the project finally got some traction when their MIHU said they would effort the list and go see the patients. The EMS staff went out to patients at risk for readmissions within a certain amount of days for common reasons and headed those potential catalysts off by doing things like making sure they were taking their medication, that they had food and were being taken care of and either had made or had the means to make follow-up appointments. The concept was not wholly embraced at first. Frady said they did pushback from some clinicians who doubted the validity of the findings and the project. Frady said she views pushback as a gift, and an opportunity to prove your case, which is what they did. When the EMS staff was interviewed, they said they were really happy with the program and felt they were actually getting to people who needed them. “That’s better than the numbers, is that they were actually reaching them,” said Frady. They knew their expected percentage of patients likely to be readmitted. Using that same cohort, they looked at who really did come back and whether there was a significant difference. One of biggest pushbacks they felt was how they know it was the visit that was the touchpoint that caused the difference. Frady said maybe they couldn’t say 100 percent that it wasn’t a combination of things but they were pretty sure the visits made a difference. The data showed that through June 2018, there were 382 patients that did not come back within the 30 days/ readmission. That 382 readmissions that were avoided at least in part due to the program. Frady said approaching AI is tricky and it is easy to get caught up in “cool new technology.” But first and foremost, you have to remember this is about the patient first and not about the cool technology. Keep the patient at the center. Think about the things you feel you can do about an issue and use AI to target. “Talk about the patient and then talk about the technology and how it can help the patient,” Frady explained. find some champions that are on the clinical side that can support the work and give them proof points for when they are talking about it to their peers. Use them very specifically and make them feel confident in the solution so that they support it. Finally, your organization has to decide whether it will build up an internal data science team or outsource. “That’s a very critical decision because data science team are very expensive. We are talking resources in money and time and it would take years. Some larger systems can do that. When you can’t, it’s finding a partner that will get to know your organization, your strategies and what is important to you and how they can support that,” Frady said.